Apex Magazine welcomes back cover artist Marcela Bolívar, whose beautiful art was last seen on our August 2016 issue. 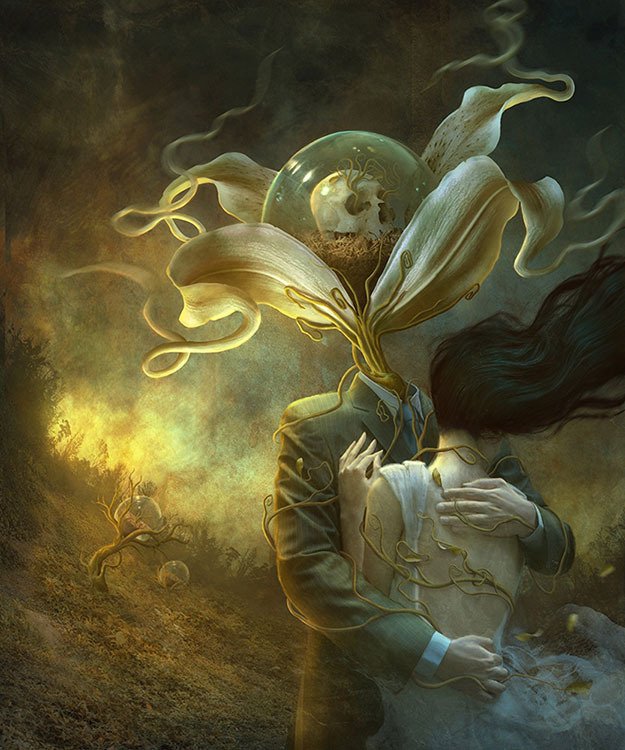 With a unique style and gorgeous techniques, Bolívar’s work enchants viewers with deeper questions about fantasy and darkness. 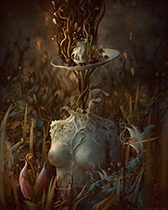 APEX MAGAZINE: Your cover art piece, “Hydroponic,” begs the viewer to examine every part of the image, making decisions between the beauty of nature and the possible horror of the woman’s life (or death). How do you decide, as a visual storyteller, what the balance between subtlety and horror is, especially with something like a leaf in the eye? Have you seen works by others that might have gone too far graphically, or is that purely up to each viewer? MARCELA BOLÍVAR: I have never considered my images to be linked to horror so I don’t consciously decide the boundaries of my visual representations concerning this genre. This image came to me as an experiment done in an overwhelming creative block. My goal was to explore textures in my garden while making a cathartic image of my then-current mental state. A hollow, dead-like body starting to breathe life again through nature was for me a good analogy of how I felt at the time. AM: You show your pieces in physical galleries as well, such as the Lonely Crowd exhibition at the Helikon Gallery & Studios in Denver, Colorado. When people are talking about your work, do you get comments from a show or gallery that are different than what you get online? Is the feedback you get from gallery owners and curators different from art directors and publishers? MB: I wasn’t able to attend the last exhibitions I have been part of, unfortunately, but the questions I get are quite varied and solely depend on the person. Some are interested in the meanings behind it, others are more curious about the method. Owners and curators are more interested in your point of view, how unique it is, how does it translate in your visual style, and such. Publishers, of course, are attracted first to your work but would like to see that translated into their own idea while (hopefully), keeping your own style. AM: On your DeviantArt gallery, you have a calendar called “Photo Art II” featuring various works. I have found in the past that creating a set of my own art like that can be difficult, trying to pick the right pieces. Were there pieces that you wanted to add but didn’t have room for, or was it easy to choose? Were the included pieces based on what you felt the audience would appreciate, or more on your own favorites? MB: Well, I unfortunately don’t have a lot of personal work to display in these kind of items. That’s why this calendar wasn’t released until two years later! I wish I was more productive with my own works. The selections were then a mixture of personal images and some client work that represented enough of my vision and style. AM: Many of your pieces, like “Cold Vessel,” integrate nature and natural textures with humans, in ways that suggest an interweaving of fantasy and horror with nature. Have you run into any comments from people who don’t appreciate what you are trying to say, either from the horror side or those who simply can’t grasp a meaning behind the image? MB: Not really. Of course it might not be everybody’s cup of tea but people who share their thoughts with me always keep it positive. 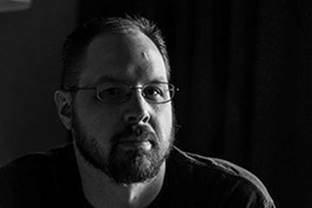 I like to think people who enjoy my work and normally comment in my images appreciate the details and style, and know that my work will always have dark underlying themes and sometimes occult symbolism. 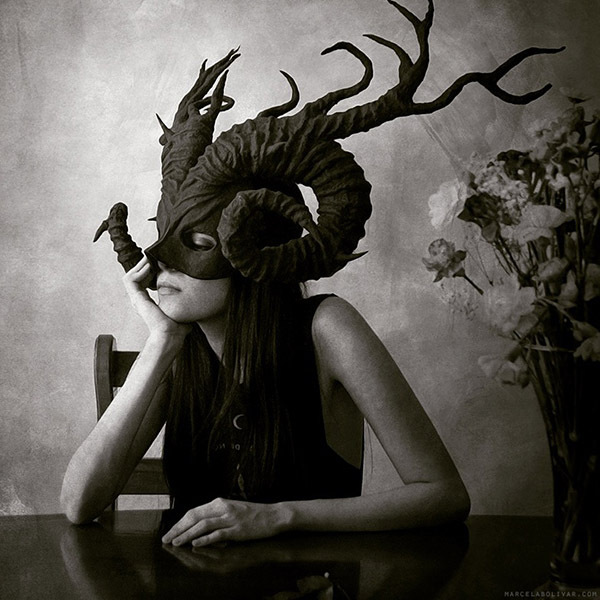 AM: Your galleries feature masks and faun horns that you’ve made, including in the main photo on your DeviantArt page. I’ve noticed myself that over time my sculpting has led to a better understanding of light and distance. Are your three-dimensional ideas separate from your digital and two-dimensional work, or are they mainly props? Has creating the masks led to new methods or ideas, either in your painting techniques or content? MB: For me creating masks and crowns is like designing new creatures. These accessories grant the human body a new persona to live in and, therefore, a new story and world to portray. So masks, crowns, and other props are always intertwined with the world I have in my mind. But you are right, having such important objects under my control has given me a not only a deeper connection with my images but a technical knowledge at the time of composition and lighting, where I carefully manage the best way to illustrate my concepts. AM: Thank you, Marcela, for a fascinating look at your ideas behind art. To see more of her work, visit her website at http://www.marcelabolivar.com/.